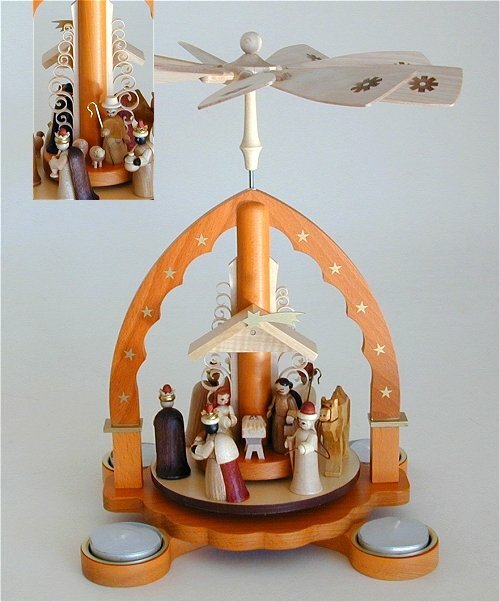 We are pleased to offer this selection of fine wooden Christmas pyramids from Germany. 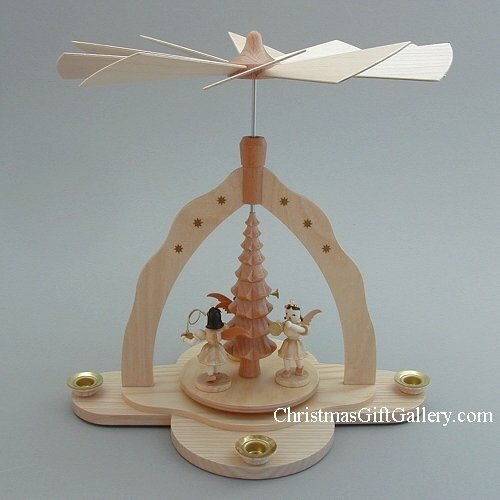 Family craftsmen have produced these wonderful pieces for generations specializing in various designs. 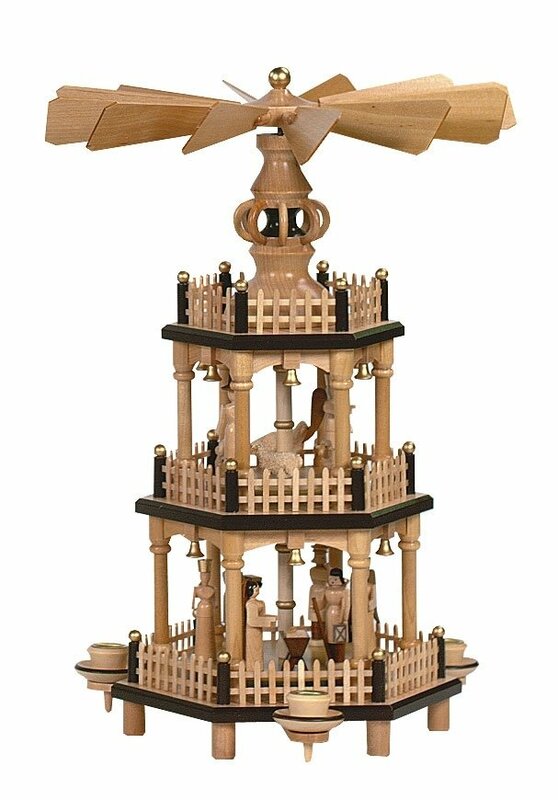 Choose from a single tier Christmas pyramid with small chimes up to a larger three tier piece. With the candles lit the various tiers turn with the fan's movement from the rising heat. It is a unique and striking example of Germanys traditional wooden folk art, and a piece you will treasure for many years. Heat rising from candles turns the paddles to rotate figures around the manger. A very different style of pyramid in that it has a true front and back as well as a series of small arches that decrease in size adding a sense of perspective to the scene that you don't get with the traditional pyramids. Three angels rotate in the center of the piece while two angels are fixed in the front. 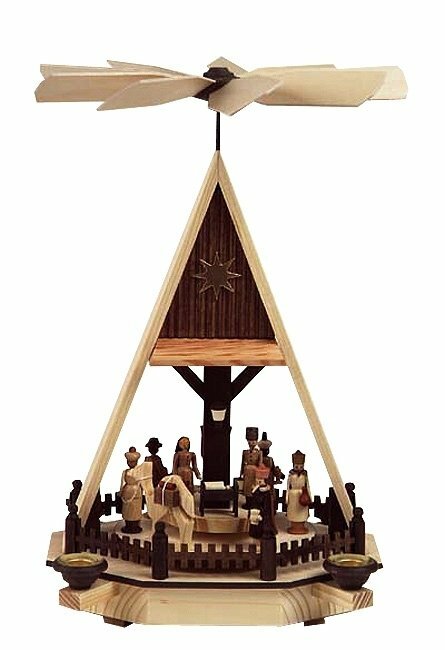 A beautiful nativity single tier pyramid in natural woods. 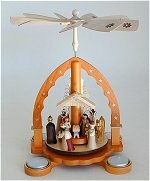 The wisemen rotate around the center scene of Mary and Joseph with Baby Jesus. Please look at the larger photo to see the detail of this piece. 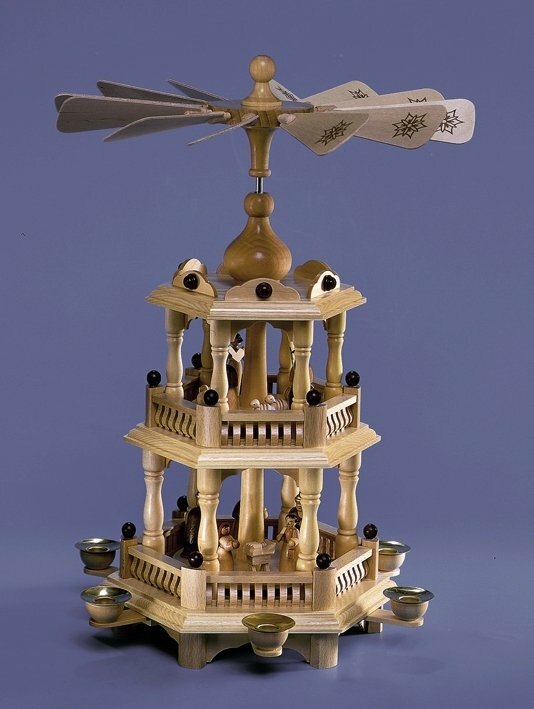 Shown without candles to allow a better view of the figures. 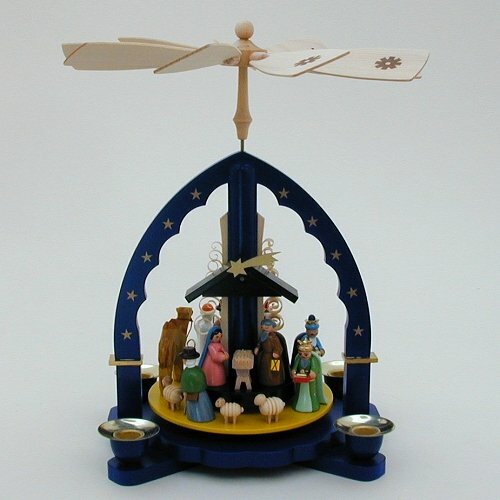 A beautiful piece where the center nativity scene is set in place with the wisemen and shepherds revolving around it. 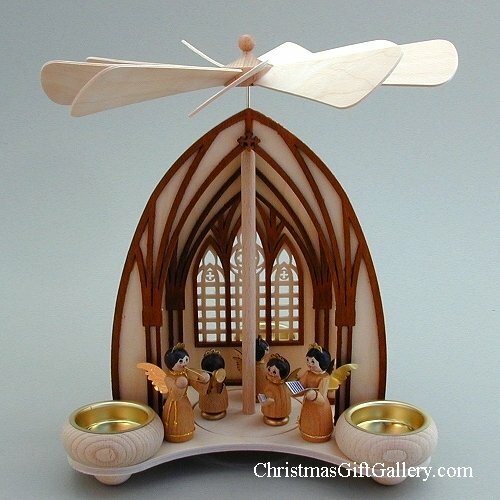 The use of the various colored woods for the figures gives a nice effect against the warm colored base. Always use caution with any lit decoration and never leave unattended. Please look at the larger photo to see all the figures and the beautiful contrasts in the woods used. 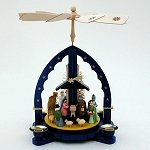 All hand made in Germany. I mentioned earlier that different families specialize in designs and this piece shows some of the different ways of making a pyramid. 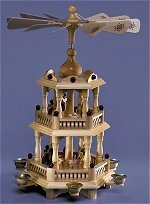 Compared to the previous two tier piece you will see that this piece is made as a heavier version. It is easiest seen in the fencing, center post and the supporting columns. Both pieces will provide generations of joy when used and stored properly this one will simply take more wear and tear from those not quite so careful. I would note here that none of our pyramids should ever be left unattended when lit and should be viewed as decoration and not a toy. I am a fan of the moonman image. Here he is looking after his sheep and moves slowly around with them as the heat of the tealights moves the fan. The tealights are a nice change in that they are easier to find than the candles and they have a longer burn time. 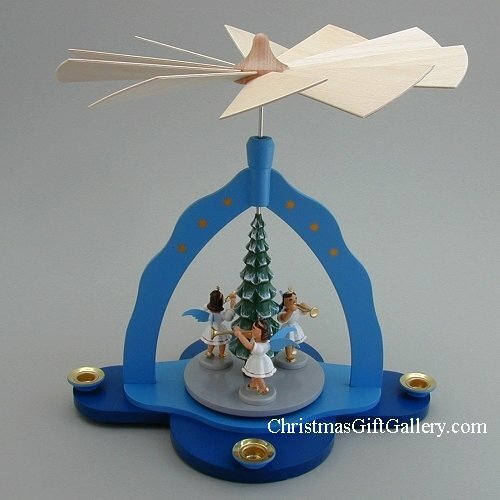 A simple bright blue arch pyramid with four angels that revolve. 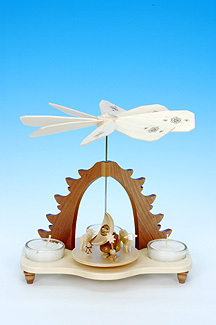 A simple bright natural colored arch pyramid with four angels that revolve.